Smell is an incredibly powerful sense and one that rouses the memory quite unlike any other. Being able to express ourselves through our scent is a wonderful privilege and there really is nothing quite as glamorous as misting our favourite fragrance over us. We all have our own type of scent, our preferred perfume appearing on our Christmas list year after year and our friends and partner knowing when we are close because they have come to know are perfume. However, these perfumes, though lovely are mass produced and unoriginal. Kiehl’s essence oil’s come in a staggering 122 unique fragrances. 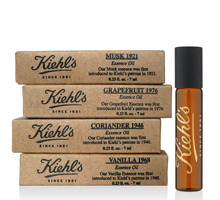 Formulated in the original “Kiehl Pharmacy,” packaged into an elegant amber glass cylinder with a roller ball applicator. Not only can you wear these scents alone, but you can also blend as little or as many of them as you wish, to create the ultimate unique fragrance to express yourself. Each individual essence displays the date of their first known introduction, ensuring every scent recalls a unique period in Kiehl’s history. All essence oils are priced at £20, which a reasonable price, allowing you to build up a collection of your best loved oils and giving you the freedom to create more than just one scent by combining them together. You can purchase Kiehl’s essence oils from here.